When I am off on holiday, I always like to pop to the shops to pick up some face masks to take away with me. I’m always so busy when I’m at home so when I travel I really like to take some time out for me. This usually involves pampering myself every other night or every three nights with a face mask and a hair mask. It always results in me coming home from holiday feeling like a million dollars. Its just a shame that it only lasts a few weeks haha. This time I went to Superdrug as I was picking up some of the large cotton pads that I love and I spotted that they had some of their own brand face masks in single use sachets. I thought that these would be perfect for taking away with me along with the other masks that I’ve already bought as if I don’t end up using them all then I can take the ones that are left home with me rather than having to take a half empty pot home. The first one that caught my eye was the Hydrating Facial Sheet Mask. I haven’t tried a fabric sheet mask before but I’ve been wanting to try one for ages and ages so this one seemed perfect for me. This mask is designed as a five minute quick beauty fix for drench dry, thirsty skin. The fabric sheet mask is soaked in moisturising Plant Collagen and Glycerin as well as refreshing seaweed and is designed to infuse the skin with vitamin goodness to leave it feeling very smooth, soft and supple. This sounds like it will be exactly what my sun drenched skin will need come the end of the holiday! The next one that I picked up was the Superfruits Exfoliating Mask which is suitable for all skin types. It one combines raspberry, cranberry and blueberry extracts and aims to deeply purify pores and smooth the skin. I think that this will be perfect to use while I’m away because I’ll be applying suncream often and makeup every night which may start to clog my pores, plus my skin may be uneven or a little rough after drying out from the sun. The last mask that I purchased was the Dead Sea Purifying Clay Mask. I love clay masks because I usually find that they’re the most effective on my oily skin. This one contains Witch Hazel and Willow Bark extract which are great at helping to heal blemishes. It is a mask that is designed to deeply cleanse and clarify the skin and it is ideally suited to those with oily and blemish prone skin. While my skin isn’t spotty by any stretch of the imagination, it is most definitely oily! All of these masks were 99p from Superdrug. 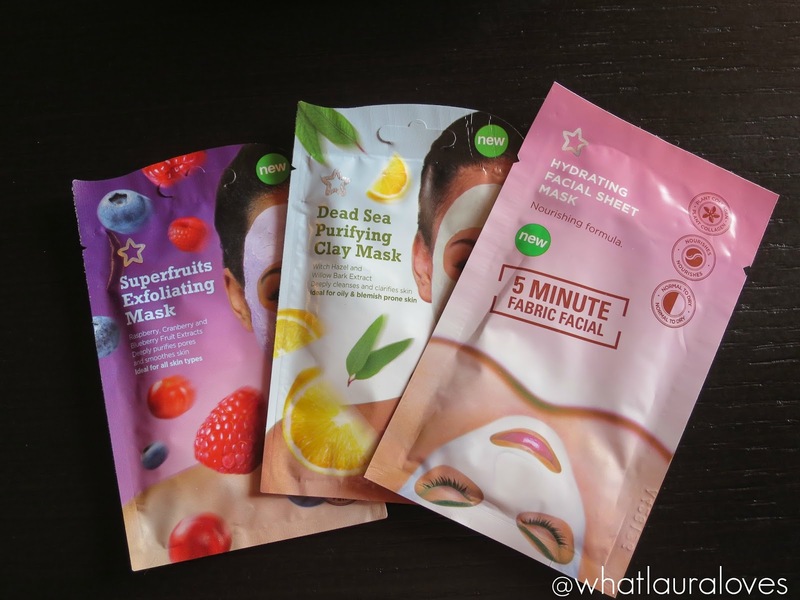 What are your favourite single use face mask sachets? Previous Post Throw Those Curtains Wide, Bring Summer Inside This Year! this is exactly what i want to read right now been on the hunt for a good face mask, great post!